The bride might be the wedding star, but that doesn’t mean the groom can’t shine too! 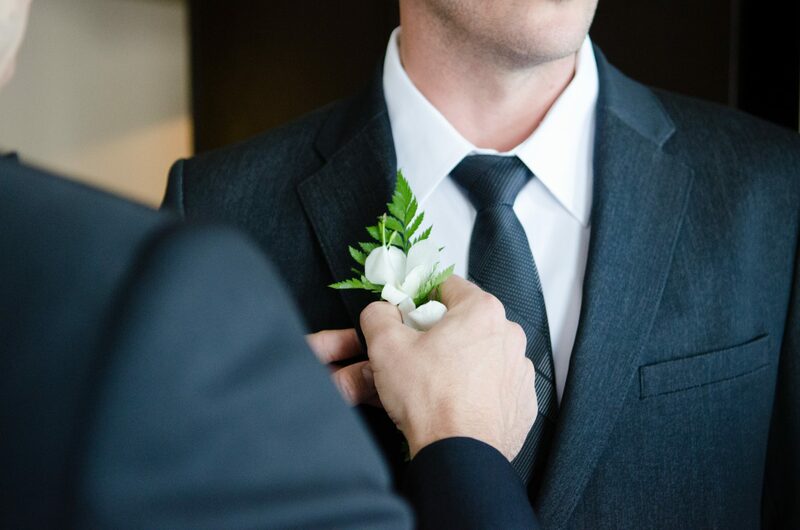 If you’re in the midst of planning your second wedding and want to ensure your groom looks amazingly-fantastic, keep the following tips in mind. Yes, off-the-rack tuxedos and suits are cheap, especially if you’re renting, but they generally don’t fit as well. Such suits are designed to accommodate a wide range of male sizes and shapes, so either spend serious time at a tux rental shop finding the right suit or spend a little money on a custom option. If you decide to purchase a custom suit instead of a tux, your groom can easily wear it to other formal events. Keep the color of the suit lining and stitching in mind when shopping. Colored linings and stitchings add something special to a suit and provide it with “personality,” as do unique lapels. For example, velvet, silk, paisley, or textured lapels allow your groom to look super-snazzy and charming. Don’t forget about your wedding’s location when putting the groom’s look together. For example, if wedding #2 is happening on a beach in the Caribbean, a tie-free linen suit is ideal. If your nuptials are happening at a high-priced hotel in New York City at night, a tuxedo is basically the only option. Cowboy boots and a cowboy hat work for western weddings, while light-colored suits are perfect for warm weather affairs. Style the groom with a bowtie and cummerbund if your wedding is crazy-formal, and have his groomsmen wear vests with long ties. This creates a dramatic, sophisticated look that everyone in attendance will moon over. Hope these tips inspire you! Have fun!